If you need support with any issues around the Free Movement website, this is the place to get in touch. Check the Frequently Asked Questions first and if you cannot find an answer then please use the support ticket system at the bottom of the page and we will get back to you as soon as possible. Just put the relevant ebook or ebooks in your basket as normal and you will find the full price is automatically discounted at checkout. It is clearly stated on the sales page and on receipts that ebook links expire after 48 hours. 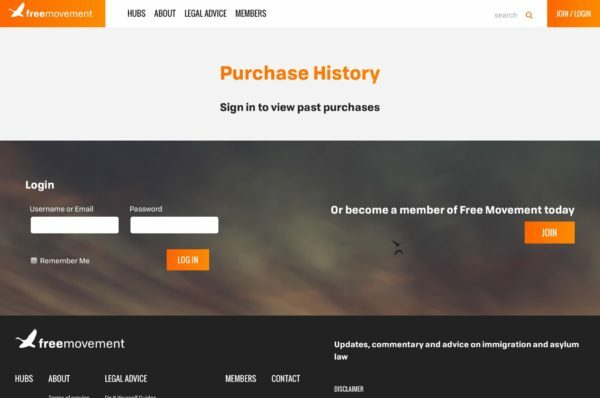 If you created an account during purchase you can come back to the website and download previous ebooks for free from the Your Purchases page (also available from the Legal Services drop down menu item). If you are a lead user for a group you can add sub accounts yourself by going to the top menu bar and clicking “members” then “your account” then selecting “subscriptions” then clicking “sub accounts” and adding (or removing) sub accounts from there. You can watch a short walk through video of how to do it if you are not sure. Seraphus Solicitors provides the legal services in partnership with the Free Movement website. Seraphus specialises in all aspects of immigration to, and remaining within, the UK. Seraphus have developed a reputation borne out of an exceptionally high record of success based around bespoke services. Seraphus consist of Christopher Desira and Christopher Benn, see the ‘About’ section of this website for further details. All payments are taken online. You will need to pay using a visa, debit or credit card. Once you have purchased a service you will receive a confirmation email containing your receipt and further information on the purchased service. All our fees must be paid in one payment, in full. You can cancel your purchase by contacting us and we can offer you a full refund so long as we have not commenced work. Yes. The information and documents you send us are protected. We use a secure SSL certificate on all pages of the website. Seraphus Solicitors are registered with the Solicitors Regulation Authority and the Information Commissioner’s Office, the latter ensures our organisation meets information rights obligations. Your data will be retained for 6 years and then securely destroyed. During the 6 year period a copy of your records will be available upon request. This depends whether you are a solicitor, barrister or OISC adviser (click links to take you to the relevant pages). All the legal regulators have moved away from a purely time based system to one emphasising the need to identify your own training needs then show you have met them (applies to barristers from 1 January 2017). Regulators now look at the effectiveness and relevance of training as well how much time you spend. We are sorry but we cannot give free legal advice or help. We put a lot of work into making a lot of information available for free on the blog or very cheaply through the ebooks. You can book one to one legal advice in half hour sessions through the video link advice service.